Hiut Denim Co make jeans in a town that used to have Britain’s biggest denim factory. Each and every pair of Hiut jean is made – and signed – by the same maker from start to finish, has a History Tag and the coin pocket is specifically redesigned to fit the latest iPhone. Knit hacked a pair of jeans to tell Hiut’s story by utilising Bare Conductive Electric Paint. 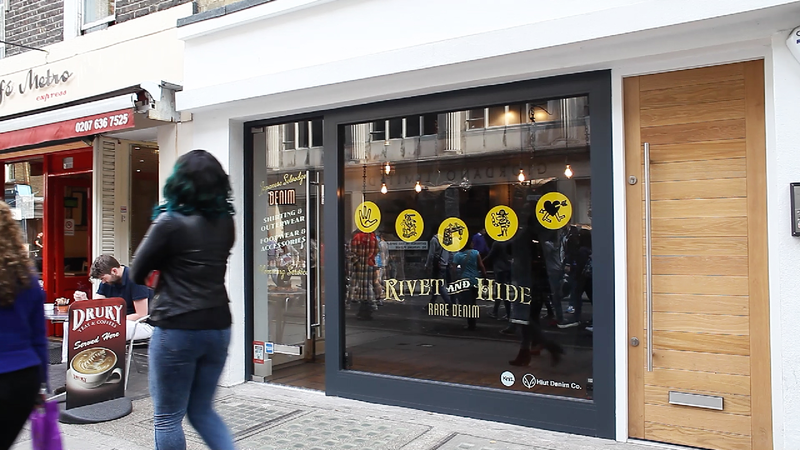 Knit utilised the window space in specialist jeans store Rivet & Hide to create an installation. Potential customers can hear the story of the brand by interacting with the icons on the outside of the window. The icons (taken from the Hiut 2012 Yearbook) represent different parts of the brand story are painted onto vinyl on the inside of the window Electric Paint, with wires on the inside of the window linking to the relevant parts of the jeans. Inside the pair of jeans includes various Arduino and shields to control the audio samples and triggers. The Electric Paint is able to detect the change in the capacitance as the person touches the window icon, which in turn triggers the circuit to play the relevant audio sample. As well as audio, light bulbs are also triggered to switch on to create visual impact. Creative Review | Design Taxi | Trend Hunter | Pioneering OoH | Pocket Lint | Bare Conductive | more.